This sensitive portrait of an elderly man with sharp eyes shows M.T. Hla’s technical skill as a draughtsman and watercolourist. The details of his face are exquisitely drawn and well observed – the lined forehead, the dark eyebrows but greying moustache, and the high cheekbones. 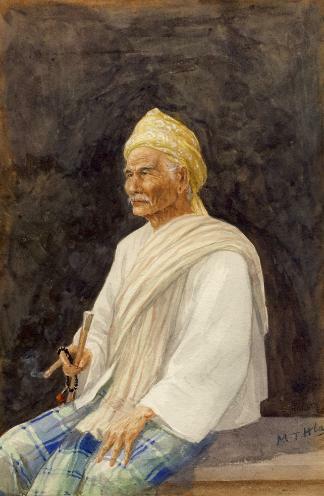 The sitter holds in one hand a metal-topped walking cane, a smoking cheroot and some Buddhist prayer beads. The blue chequers of his longyi contrast with the white of the upper garment. The work is signed ‘M.T. Hla’ in the bottom right-hand corner. Along with Ba Ohn, U M.T. 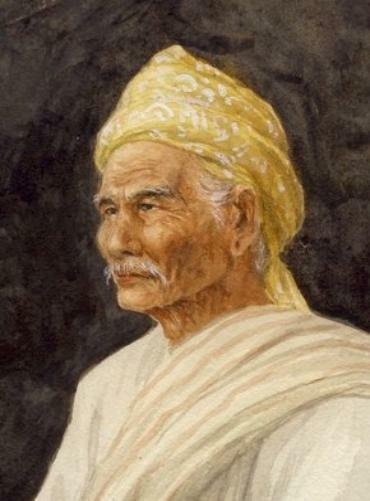 Hla (U is the Burmese approximation for Mr) is the earliest pioneer of Western-style painting in Burma. Both received personal instruction in Western painting techniques. M.T. Hla also received traditional instruction and undertook traditional painting decoration for the banners and other decorations associated with Burmese Buddhist celebrations and ceremonies. Ranard (2009, p. 57) comments in respect of M.T. Hla, that ‘more than two dozen of his paintings have surfaced, most of them watercolour…’ It is likely that most of the artist’s works were acquired by colonial administrators and their families and brought back to England and Scotland in the early twentieth century. It would appear that very few of the artist’s works have survived in Asia. Several paintings by M.T. Hla are found in the collection of the National Museum, Myanmar, however. M.T. Hla is historically important in the development of modern Burmese painting. His work represents a break with traditional styles of painting and heralds the evolution of a vibrant and dynamic painting scene in Burma which lasts to this day. Khin Muang Nuynt et al, Myanmar Painting: From Worship to Self-Imaging, EvoHeritage, 2006; and Ranard, A., Burmese Painting: A Linear and Lateral History, Silkworm Books, 2009.